SHP continues its safety technology innovation series with Airsweb Product Development Director, Rob Leech. This time we look at how the company is utilising existing NFC and QR Code technology for the benefit of contract workers. NFC (near-field communication) technology allows two items placed within a few centimetres of each other to exchange data. Rob describes it as essentially the contactless transmission credit card system we all use every day to make payments using our mobile phones, thanks to radio-frequency identification (RFID). The advantage of NFC, as opposed to other forms of data transfer, is that it can be used multiple times. Stickers or “tags” are used to hold data, links to websites, commands to open mobile applications or prompts to send a text message. Airsweb is using this technology to help clients have easy access to its AVA platform. 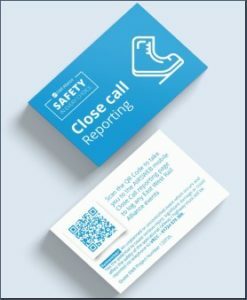 The stickers provide a link to a website contain important information required when working in a particular area of a site, or to provide a quick and easy way to report an incident or near miss. NFC ‘tags’ are relatively cheap, widely available and re-usable, meaning they can be reprogrammed to enable them to be used elsewhere or for the information or destination link contained within them to be regularly updated with the latest information or regulations. The technology enables quick, anonymous access for companies to track events. Its convenience allows fringe workers to report a hazard, or to receive information about a hazard, be it a product fact sheet for a chemical or a video showing how to correctly use a piece of equipment. Helpfully, not all reported incidents go straight into a company’s statistical database, they can be sent to a triage stage for review, before being logged if necessary. QR codes are mobile device readable bar codes that can store information. Usually this information is a link to a website. It performs much the same function as NFC – but is perhaps a more recognisable format. Multi-disciplinary railway infrastructure contractor VolkerRail initiated a detailed review of its current close call reporting process and systems, with its workforce in 2017. The results showed that the lack of feedback from the current system and the difficulty of reporting for transient workers, or those who do not regularly visit the corporate office, created a barrier to reporting live. VolkerRail approached Rob Leech to see if there was an innovative solution via Airsweb. The Airsweb system was programmed to interact with the QR codes, so when a phone is placed over the tag it launches the worker straight into the relevant area and prepopulates the site they are working on. Emma Glenc, Health and Safety Strategy and Performance Manager at VolkerRail Ltd, said: “Our main promotion of this feature was to ‘Just Report It’, if you think something is wrong, don’t spend time thinking what category of event it might be – report it! We wanted to give our workforce, and subcontractors, personal empowerment to quickly and easily report potential unsafe acts and conditions observed in the workplace without fear of reprisal. 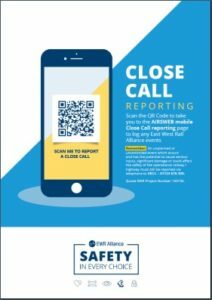 A pilot of the QR Code Mobile Close Call Reporting solution was run within the East West Rail Phase 2* (ERW2) alliance, which VolkerRail are a part of. Within eight weeks of implementing the QR code process on EWR2, more than 89% of all close calls raised were via this method. This continues to be the case today. VolkerRail has since launched this new system across its business, to all projects and has seen a 59% increase in close calls being reported, 35% of which were raised using the QR code mobile functionality. *The East West Rail Alliance is a collaborative partnership of Network Rail, Atkins, Laing O’Rourke and VolkerRail, tasked with the delivery of Phase 2 of East West Rail – connecting the economic centres of Oxford, Milton Keynes, Aylesbury and Bedford by providing a quality railway and integrated transport system that improves regional and national connectivity and increases network capacity. Costing circa £1 billion, over £100m of this is for the outline detailed design for the route, with over 20 different specialist disciplines involved. 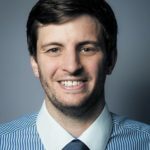 Safety innovation: Using NFC and QR technology to identify risk SHP continues its safety technology innovation series with Airsweb Product Development Director, Rob Leech. This time we look at how the company is utilising existing NFC and QR Code technology for the benefit of contract workers.